Often when I’ve brought up issues related to sub-par bicycling conditions that I believe pose a safety hazard, I’ve been met with criticism. However, I remain convinced that high quality, smooth streets and paths are imperative if we expect more people to give bicycling a try (and an OHSU study agrees). Over the weekend I read something in The Oregonian that was just the latest validation of my feelings on these issues. The article was about Fred Armisen, co-star of the hit cable miniseries “Portlandia”. However, if he moves to this streetcar-laden neighborhood, will he ride his bike around like he did in the infamous “Bicycle Rights” skit asks The O? Armisen is young and healthy. If he’s too afraid to bike in the Pearl, what does that say about our city? No word yet whether or not Armisen will lend his acting talent to the upcoming City of Portland video about bike/track safety; but perhaps a cameo would help raise the profile of this important issue even more. It probably does cut both ways. Some folks are really good on their bikes (trials riders in disguise). But for the most part I think it is reasonable to expect a minimum of known hazards. I was thinking of lasers. Shark tanks with lasers. I second. I’m tired of hearing that I should just satisfy myself with the status quo. The argument is that things are better than they used to be (or better here than in other places). But if no had stood up and said “this needs to be better,” then there would have been no improvements in the first place (or in this place). The BTA and the BAC should be much more active pressing PDOT and Portland Streetcar on these issues. I’m sorry but streetcar tracks are not on every lane on every street in the Pearl. Ride in the left lane on NW 10th/11th (its a neighborhood street not I-5) or on an alternate street like NW 9th, 12th, 13th. NW 9th would make a great North-South bike route between Naito/Centennial Mill and PSU, all it needs is a signal and crossing at Burnside/9th… it connects and crosses all the good east-west routes in Downtown and the Pearl. Both the Pearl and NW need good north-south bike routes for otherwise fantastic bike-oriented neighborhoods. On that subject, why, even downtown, are all the green lines on the bike map running east-west? I support those who say “Toughen up! Stop whining! Learn how to ride your bike and get over it!” and I say it myself. If we can’t get to work without expecting the city to make special accommodations for us with the streetcar tracks, we’re big wimps. I realize it’s an inherent danger, but if we spread our resources too thin across too many an issue then our strength will be diminished. A conclusive list of pertinent issues needs to be composed with topics having numbered priority. By simply having heightened motorist awareness we could alleviate many of the problems experienced on a day to day basis. And I think to be afraid to ride a bicycle in the pearl is just sad. It’d be like being afraid of taking a walk in a park for fear of stepping in dog dookie. Man up. I’m pretty sure “man up” isn’t the appropriate response to get the ~60% “interested but concerned” on bikes. I have no idea if there is an answer for the streetcar tracks issue, but, yes, better conditions will be the key to getting more people on bikes. That includes the development of cycle only or walk/cycle only routes. I don’t see huge progress being made from here, unless such routes are developed. The bike industry is a bit at fault, too, by promoting the narrow tires that get caught in those gaps. Amsterdam has tons of tram tracks. I got caught in them once but never made the mistake again; I learned as everyone else there knows you simply turn your front wheel slightly perpendicular to the track when crossing and there is no problem. 42 mm? i might be persuaded to 32, but i have been perfectly happy with 28. I crashed and burned on 32 cm tires on so wide tires on going to save you from trolley tracks. The one time I got tangled in the tracks, I was riding a bike with either 26×1.95″ slicks or 26×1.5″ slicks. I can’t remember which because I changed from the bigger to the smaller sometime around that time. Don’t think that switching to 35 or 38mm is going to help that much. I so agree with your article. Plus, pinch flats, etc. This is why I have been saying for years that if Portland wants to really be a biking city, facility maintenance needs to be much better. I cycle from Beaverton-Hillsdale down the ramp onto Barbur, and there is a spot where the blackberry vines are so overgrown they force me into the car lane on a fast descent. Bad paving can cause an accident, so can gravel, broken glass, on and on. This is about safety. There are some tree branches that hang too far down on the intersection I turn off to get to my place. I didn’t like how it forced me into the side with the oncoming traffic. So, I took some trimmers and cut the branches down myself. I could have complained to the city, but why when in a matter of five minutes, the problem was solved? I also got a flat by some overgrowing blackberry brambles on the Sunset Hgwy MUP. The next day, I had a pair of trimmers and cut some of them back. I realize it may be more difficult on a busier section of road like the B-H Hgwy, but sometimes it just makes more sense to take care of things like this ourselves. I admire the self-sufficient attitude you’re advocating here, but at the same time I don’t think we should lose sight of the degree to which SO LITTLE accommodation and forethought is made even in the height of the Portland-bike-culture ascendancy (didn’t know what else to call it) over simple things like laying blithely laying streetcar tracks and telling us it’s good for us. There are disused rail tracks that cross part of my commute and are quite treacherous in the dark and wet of winter, but rest assured I’d be arrested if I showed up at 3:00 am with some traffic cones and three bags of ready-mix concrete. Likewise if you don’t have the permission of the owner of the trees you’re pruning that’s trespass to chattels which statutorily carries treble damages. If trees and bushes grow into the ROW of an automobile lane, they _will_ end up being pruned by automobiles and trucks. And good luck trying to sue passing traffic for tearing branches off the plants you’re not pruning back! Ditto for bicycle lanes; most bicycles don’t have the mass needed to prune back overgrowth (a bakfiets with 200 pounds of aggregate in the bed would, I suspect, be enough for all but the most stubborn growth,) but I don’t think that grants you adverse possession of the public ROW. At least if someone comes along and prunes them back you get a clean cut instead of torn off branches. The branches in question did not require me to go onto the property. I was standing in the street when I was pruning them so would be hard to call that tresspassing. And, I really don’t see the landlord of that apartment complex doing much upkeep in general so doubt they would even notice. Any vegetation extending into the street at less than 11 feet is illegal. Likewise, anything less than 7 feet above the sidewalk is illegal. Being a tall person, I frequently prune branches from the sidewalk if they hit me in the head. The biggest safety hazard to cyclist are drivers who are texting. It happens on every street ALL the time. Bigger issue than DUII. The biggest safety hazard to cyclists are their own decisions. I’m not sure that I follow. Can you provide some specific examples? For that matter, one could say the biggest safety hazard to “people” are their own decisions – a statement so vague, it’s practically meaningless. Let me restate that – the biggest hazard to pedestrians are the cyclists who fly though 4-way stop intersections playing with their iPhone. This semi-annual plea to ‘do something’ about the tracks smacks of idiocy. What will be done, remove them? That is the only option, and not a viable one at that. If Fred Armisen is afraid of riding in Portland he should stay in NYC. Use the existing streetcar system with some sort of mitigation (flange gap fillers?) but develop all new routes using a non-rail system. Make the new cars backwards-compatible to work on top of the old rail system. Phase out the rail portion as it amortizes itself, eventually covering, filling or replacing the rails. Build separated bikeways, adjacent to streetcar tracks. Design it so a person on a bike never comes across an opportunity to get their wheel caught and crash. This could be done in the most problematic areas, but it requires political will, funding and most ardous of all, parking removal. Until we do this, and we will, there will be many people who refuse to get on a bicycle. The only way our city can get to its stated goal of 25% bicycle mode share is to deal with these safety obstacles on ad design level. The fact is, fear keeps a huge percentage of people from biking. You can say “man up” till you’re blue in the face but it won’t get people on bikes. Making safer options, especially off-street routes (trails advocacy here) is the only thing that will get a huge percentage of the population to ride a bike. And it’s worth the public expense for so many reasons – exercise, air quality, reduced load on transportation infrastructure. The cost of trail development is a fraction of the cost of roads. Phew, I love a good soap box! Biking *is* dangerous. It isn’t only street car tracks. There just isn’t much between a small mistake or hazard and laying on the pavement. You either accept that and ride or you don’t. No judgements about the city, your age, heath or what you feel about the environment. Phil you are so right. Best go lay on the couch and play video games then Phil. Get rid of your bike…. Biking is not dangerous. Not significantly more likely to lead to injury than 100s of other activities. However the street car tracks strike me as particularly egregious because they are placing a known hazard into the roadway that will be there permanently. You can also ride slower. Did Fred get caught in the tracks while he was filming this skit? If he was, I can how focusing on staying in character (ie. being distracted) would make one vulnerable to the tracks. But, the same could be said for a pothole or a dog off its leash. Regardless, sorry to hear he got hurt. But, to say he won’t ride because of the street car tracks sounds like one of the many excuses I hear from every “gee, I would like to ride my bike, but I can’t be cause of ______, ______, and/or _____” non-cyclist. As others have pointed out, there are plenty of good streets to ride in the Pearl. I think the bulk of us “just man up” crowd (gee, thanks……) are simply trying to point out that the tracks are a KNOWN hazard and they are an avoidable hazard. I also think the bulk of us “stop whining” crowd also believe that there are things we can do to improve them and we need to do find those ways. But, for the time being, we will find alternatives. If all the streetcar tracks were magically fixed across the city so they were perfectly bike-safe, people who don’t/won’t bike would still find a reason to be scared to ride. Like awhile back when bikers were upset about too much bike traffic on Williams and bikes passing closely and moving too quickly… For every reason not to there is another reason TO! On one hand, I agree that it is kind of sad for someone to be too afraid to ride in the Pearl. However, like most of the people who read this site, I am not the key type of person we need to convince to get on a bike in order to make cycling a much more significant part of our transportation future. To accomplish this goal, our cycling infrastructure needs to be able to accomodate people a wider range of abilities and risk tolerances. We can’t simply accept an ongoing litany of injuries to cyclists and damage to their property due to hazards such as street car tracks, and at the same time expect the average person to see cycling as a safe and effective mode of transportation. “Share the road” <— In this case means you choose to share that particular stretch of road with the streetcar. If you don't like that particular road, feel free to try another road 1 block over. It's like saying you love to jog the QUICKEST route…but you want your own special path with no hazards at all…even though there could be a fabulous jogging trail one block over. I love when people move from out of state to the Pearl, which is the least “Oregon” or “Portland” neighborhood in our state. Perhaps they have different values and wants than you. You are no better than them just because they choose to live in the Pearl. Every city needs an upscale area. I can’t believe all these yokols who live in Portland and think they are “Oregonians.” They probably only moved here within the past 50 years! True Oregonians live in the mountains herding sheep and cattle. We ride horses and carry six-shooters, instead of sipping on free-range coffee and communist-made iphones. In the rain. Without “Gore-tex” rainproof weather gear. You city folk make all us Oregonians laugh! They should hire me as Fred Armiston’s “stuntman” for the bike riding scene, considering all my friends say I look like the “Militant Bike Messenger” character. 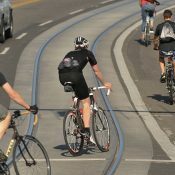 The ongoing series of articles criticizing the streetcar over and over again is growing a bit tiresome, and making me have a much lower opinion of bikeportland – a blog that I otherwise enjoy very much. I live in the Pearl, and work downtown. I don’t own a car, so I walk/cycle everywhere, and yes, use the streetcar too. I’m pretty excited about its expansion to the inner eastside. Portland has done a pretty impressive job at developing a rail network with a great deal of utility. Once the loop is closed, via the Carruthers crossing, we’re going to have an inner city—as opposed to ‘downtown’—circulator that connects very well with the larger regional rail system that is the MAX, with interchanges at the Lloyd Center, OMSI, South Waterfront, PSU, Galleria. We’ve come a long way since rail in this city was a single line from downtown to Gresham. This is a good thing. If we want to tackle car dependency, we have to do it in multiple ways. Cycling isn’t the answer to every journey. Not everyone is healthy enough to cycle; some are, but don’t wish to cycle long distances; and sometimes it rains in Portland, and cycling is frankly a pretty miserable experience. Streetcar, bus, MAX, heavy rail, walking, car sharing, bike sharing, and cycling in general are all complementary, and we really have to grow the usage of all these modes of transportation concurrently. This is the model of great European cities. I kid you not, this is the first image of Amsterdam I found on google streetview – http://g.co/maps/uej8v. The horror! Pedestrians and cyclists freely crossing in-street rail! Someone put a stop to it! This region is about to make a huge mistake in its transportation planning: the CRC. Aside from the massive amounts of money that are being wasted on the unneeded bridge, it’s going to have huge impacts on traffic through central Portland. I5 is currently two lanes through the Rose Quarter, and ODOT are already working on plans for widening I5 in this section. I regularly cycle from NW to NE over the Broadway Bridge and up Williams. It pains me to think how much more difficult this fairly easy journey might become. 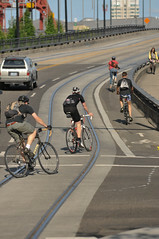 Yes, this has been covered on bikeportland, but I don’t we’re talking about it nearly as much as we are the streetcar. I think those who believe in active transportation should be picking their fights a lot more carefully. thanks for the comment. Good point about the CRC. I agree. But please understand that I’m not simply criticizing the streetcar… I’m just trying to raise awareness about an issue that exists with the tracks that I feel hasn’t been adequately addressed by the City. There’s a big difference between “criticizing streetcar” and simply pointing out issues with how it impacts the bicycling environment. You make a good point about the CRC and you’re right… I only wish I had as much coverage of that of late as I do about the streetcar issue… but that’s just how things are going right now. Again. Thanks for your comment and I’ll take it into consideration for future coverage. I agree wholeheartedly. The CRC is the #1 big problem in the region, if that thing gets built it’s going to kill other transportation funding in the region for decades, in part because of the cost of that project, in part because the next logical step will be I-5 widening to get rid of the next available gap. The fact that BikePortland is basically ignoring the story in favor of a continuous stream of stories on how people are too stupid to not ride perpendicular over train tracks is beyond absurd. And when the main writer and editor of the site says he wishes he had time to devote to the subject, but he can’t because “that’s just how things are going right now,” what are you supposed to make of that? No worries about future impacts, that next logical step is being taken… ODOTs already started to plan a widening of I-5 through the Rose Quarter requiring the replacement of 5 or 6 overpasses. It’s hard not to draw a connection between this SNL star choosing to live in the Pearl and the reasons why his Portland satire just isn’t that funny. Hear, hear. Find something clever to say about Portland or get off my teevee. All things clever appear otherwise to people who have already considered them. it seems to me, the best move would be developing all forms of transportation aside from the auto based infrastructure society has been most dependent on. I would love the street car line, interconnecting every major business district outside or downtown to the downtown and all around. Also, more cycle tracks on every major street. It is true that the U.S. has not created this type of network except in very specific cities like New York and a bit of Davis, as well as some experimental projects in places like Portland OR. However… why shouldn’t we be asking for the very best, the safest, the most likely to attract ride ship based road designs? Give it some time and places like Palo Alto will exceed what we have accomplished in this city. We need to think as big as possible and act. Stay ahead of the game. Stay ahead of the pack. We will be passed as other cities look to exceed PDX’s mode share. W could ask for the best, as you say, and perhaps we could also demand that the CRC not happen. But the risk is that we spend all kinds of money we don’t have on something we won’t need (not so different from the CRC). What I mean is separate bike infrastructure is only sensible in the shadow of the overwhelming dominance of the car. But take away the car, and the existing infrastructure is perfectly adequate for people on bikes and other kinds of people. The car will fade and it won’t take that long. I just think we would do well to keep that in mind as we plan the (near) future. Are you kidding me? This is a totally garbage article JM, you covered the issue already, this smells like fame glam. Who cares what Fred Armisen thinks other than those that cheer celebrity? Why is his opinion on bicycling any more valid than mine? I mean really, who freaking cares? Oh since Fred said it it must be true? Maybe Fred is a Fred. I bet he does not even ride a fixxxie. Keep the good stuff coming JM, but this was pure puff. maybe if the traffic engineers got out of the way, bikes and streetcars could live together harmoniously like in europe. traffic engineers sole objective is to move as many cars as fast as possible that makes streetcar tracks and bike lanes have to be shoehorned into these traffic-sewers where the “lesser modes” have to be shoved into the “slow lane” and the left side of the “traffic flow”/center of the street (where streetcars always used to be located) has to be kept wide open for the cherished left turn lanes because godforbid left turning traffic slow down thru-traffic in the “fast lane”. One thing to say here. Not to mention a huge waste of money.. Detrimental? (I guess I don’t see this. Especially if you look at European cities I think this would be a hard case to make. 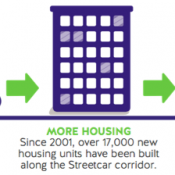 But even just in our town, Mr. Portlandia notwithstanding, are you really trying to argue that biking modeshare would be increasing faster without the streetcar? I am trying to imply that street cars are not what we need, and are a bad idea. Aw, Fred! Just ride a 29er and use a fat street tire like a Schwalbe Big Apple. Not to worry, Harvey, it could still be set up as a fixie. 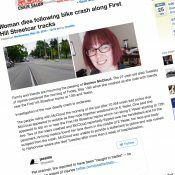 I think it’s funny that this post is illustrated with a picture showing cyclists crossing the tracks in an inappropriate and dangerous way. Why not cross the tracks at a perpendicular, then turn left into the bike lane? Bikes really can turn 90 degrees, try it some time! I ride my bike all the time and I don’t see how the tracks are an actual problem. In traffic? I’d like to see you do that. 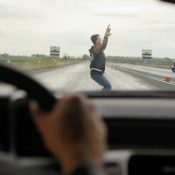 How is the guy in the car behind you supposed to know that you are performing a jug-handle turn? How would you signal? A left turn while turning (appearing to turn) right? FWIW, the folks in the picture obviously didn’t wipe out, so it isn’t a hard and fast rule–it can be something less than 90 degrees. Advice to brand new riders, get a fat tire bike, a real fat tire cruiser or a mountain bike and put fat road tires on it. They are much more forgiving to tracks and bumps. After a year or two, go for the 700 x 20 tires if you want to go faster and lighter. Bicycling is not particularly dangerous. Per hour spent in the activity, riding a bicycle is significantly safer than driving a car. These points have been mantras for cycling advocates for years, and statistics bear them out. We’re not doing much to encourage more riders (which is the best way to increase safety) by enumerating every little potential hazard and amplifying it as though we’re a bunch of Homeland Security hand-wringers spotting terrorists in every dark shadow. It doesn’t sound like Fred Armisen even crashed his bike. He simply encountered an obstacle, couldn’t figure out how to overcome it, and he gave up. My eight-year-old daughter knows how to deal with tracks; I’m kind of embarassed for Fred that he couldn’t figure it out. I’ll also never look at that skit of him riding through town the same way again. He’s certainly no rider, so I’d say he’s laughing at us, not with us. Rail provides solutions to all kinds of huge transportation issues, from neighborhood travel to cross-country cargo hauling. It needs to be part of the mix if we’re ever going to get rid of all these damn cars. Rail-born transportation is a good solution where it runs on a dedicated right-of-way, and that generally means longer distances than “neighborhood travel,” for example MAX’ greater metro connections, or freight and long-distance rails. Rails are an outdated and incompatible solution at the local/neighborhood level where many modes must share the same right-of-way (street) and rails incur physical hazards to other users, as well as comfort and aesthetic detriments. Electric trolleys on dedicated routes (streetcars) are an important piece of an urban public transportation system, but they must be made to be good neighbors with other transit modes including pedestrians, wheel chairs, bicycles and cars. Since rails do not work well with those other street users, the trolleys should use a different rolling system, NOT RAILS. This whining about tracks is stupid: learn how to ride them, slow down, fat tires. Arminsen deserves the ridicule; turnabout is fair play. Somehow trams and bikes, not to menion cars, trucks, and peds get along in Amsterdam. Surely we can manage as well. Take a deep breath and slow down a bit. Its across the tracks not down the rails Fred. As someone who has eaten on the tracks (twice in one week) I can empathize. But after the second time I went down (on 197th and Bside on the MAX line) I thought about what I was doing that made this happen twice and decided that I wasnt giving the tracks the attention they deserved. That was five years and many miles ago, havent been down since. Pay attention, cross at an angle and you’ll be fine Fred. Also someone else mentioned pinch flats- the cause of pinch flats is under-inflation. I check my tire pressure every ride and have no problems. I only add this here because I used to get them all the time and somehow made it to my thirties without hearing this useful bit of knowledge. So check your tires regularly and avoid the walk of shame.